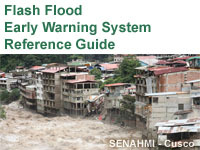 The Flash Flood Warning System Reference Guide is intended to promote the implementation of flash flood early warning systems based upon proven and effective methods already in use in flash-flood prone nations around the world. Both governmental and non-governmental decision makers can use it to better understand flash floods and the elements that constitute a robust, end-to-end flash flood early warning system. The guide includes chapters on Flash Flood Science, Flash Flood Forecasting Methods, Monitoring Networks, Technology Infrastructure, Warning Dissemination and Notification, and Community-based Disaster Management, and offers several examples of warning systems. State the characteristics of flash floods that make them difficult to predict and of such high threat. List the general characteristics and components of an effective flash flood early warning system. State the benefits of an early warning system. Describe the potential sources of flash floods and the hydrological and meteorological characteristics that lead to them. Describe the strengths and limitations of the variety of hydrometeorological sensors available. State the basic communication requirements of an early warning system. State the major components of the technology infrastructure necessary for an early warning system. Describe the variety of flash flood systems in use, including local flood warning systems, Flash Flood Guidance systems, the US NWS FFMP system. Explain how Flash Flash Potential Index and Global Flash Flood Guidance products are produced and used. Describe and distinguish between warning products, warning dissemination, and warning notification. List characteristics and components of an effective community-based disaster management program. List the questions and information that drive the development of a concept of operations for a flash flood early warning system.